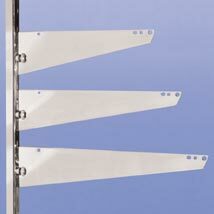 The Knife Brackets for Slotted Standards are great for holding up Wood or Plastic Shelving as well as Glass Shelves. The Knife Brackets accepts shelf rests. (#2781, #2782,and #2783). Fits slots on 1 in. on center standards. The Knife Brackets are available in 3 sizes: 10 in., 12 in., 14 in.